Yeasterday we were in attendeance to what is hopefully the first of many horror evenings at the Custard Factory in Birmingham. 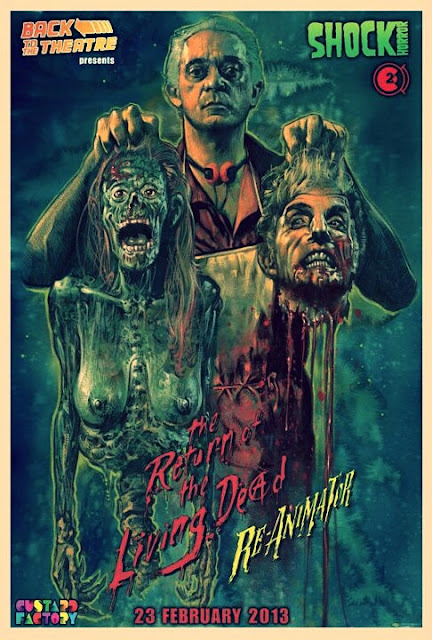 At the event not only did we get to see two of horror’s iconic films from the 80’s, ‘The Re-Animator’ and ‘Return of the Living Dead’ but also had an extensive Q & A session with RotLD star Don Calfa. On which he reflected on his career, spanning over 40 years, and the fantastic time he had on set filming RotLD. In which he included that yes, he was present for Linnea Quigley’s graveyard scene with a large grin on his face. Taking his career quite modestly, he also reflected on what he would like to have done, to which he responded working with Rob Zombie and Quintin Tarantino. In reflection to the film, also at the event were poster designer and fantastic artist, Graham Humphreys (you may recognise his work from the Frightfest posters and all over the horror genre) and Steve Mitz and Gary Smart who wrote the book celebrating the series. Decorators in glorious themed graveyard with lifelike corpse and the like, the event was a huge success and could not have gone any better thanks to all those involved including Dean Boor and Shock Horror Magazine who sponsored the event. In celebration we will be sending one lucky person with an A2 print of the poster event signed by artist Graham Humphreys. Stay tuned to our Twitter/Facebook feed for more. For full coverage of the event make sure you get the next issue of Shock Horror Magazine which will also include a full interview with the legend that I’d Don Calfa. And now for some food…. Brainssssssssss!